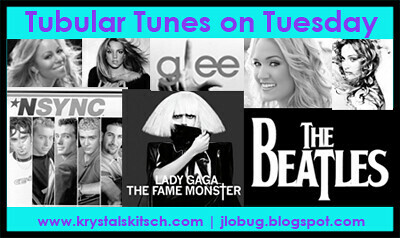 Two of my amazing real life friends Krystal and Jen have been hosting a music link up on Tuesdays. I have missed the first two weeks because Tuesday is THE WORST day of the week for me to post. I really regretted missing out on last weeks 80's post (I love 80's music!) and decided I could NOT miss this week. Note: If you are reading this via email or RSS, visit the website for the videos! I have always loved this band. It was hard to pick one song, but I decided to pick an under-appreciated and not overplayed song. RIP Brad Nowell. I am also really excited to see Sublime with Rome next month (Rome Ramirez replaced Brad Nowell and they sound pretty dang good)! Does this song really need commentary? This will still be playing when my future children are senior citizens. RIP Kurt Cobain. Of course the end of Nirvana allowed David Grohl to come to the front and truly shine. The Foo Fighters are to this day one of my favorite live bands. This is one of my favorite "guilty pleasure" songs. I have heard it a million times and it never gets old. This is another guilty pleasure song that I blast at full volume and sing until my lungs hurt. Such a beautiful and sad song. Random story: My Mom won tickets to see Live when I was younger and I didn't realize who they were. I told her to give them away. I have regretted it my entire life. Ugg. LOVE Weezer! It was a toss up between this and 'Say It Ain't So". *Nine Inch Nails- Closer (I was actually going to post the video, but it is SO inappropriate that I decided not to). See? I could go on forever. I Love music! Thanks for the fun link up and hopefully I will remember next week too. I hope everyone will join us. Ah, great tunes! I'm so excited that you were able to link up! I found it SO HARD to choose a Weever song! The Sweater Song was tied with Buddy Holly, but I went with Buddy. I'm glad someone went with the Sweater Song! This is awesome!! Huge music lover here! Thanks so much for taking the time to do this. I'm bookmarking it! Seriously I cant believe I forgot Wonderwall. Its probably one of my favorites ever! I seriously thought I was the only one who even knew of Oasis and Weezer - goes to show how stupid teenagers are! Lovely list! Scott would appreciate the BADFISH on here! :] It's hard to remember that that was early 90s. SO LONG AGO! !